I remain surprised at the number of business owners that operate without a business plan. According to Dun & Bradstreet, the number 1 reason for business failure is the lack of a business plan. Certainly, business plans are critical for business start-ups, but they are equally, if not more important, for existing businesses. This is especially true for small business! There are a number of approaches and templates for business planning such as OGSM (Objectives, Goals, Strategies, Measures) the approach used by Procter & Gamble and many other Fortune 500 Companies, as well as OGST, SWOT, PEST, and the list goes on. These types of plans may work for the industry giants, but they are more strategy driven, and frankly they lack the heart of small business. Those of us in small business need more of a holistic and integrated business plan that reflects our passion. We need a “working” annual business plan that identifies all the areas of our business, and drives our purpose. 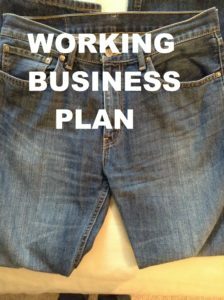 Your working business plan should be like your favorite pair of jeans—versatile, comfortable, and faithful. It should become your favorite business partner, and the most frequently used tool in your daily operation and for growing your business. It should be reviewed frequently and adjusted accordingly for situations like new opportunities, market changes, or threats to your business. Most importantly, it should serve as your compass to maintain your purpose, your mission, and your vision, as well as detail your strategy to grow and sustain your business. Your working business plan needs to be written, and include an organized table of contents that captures the key components and indicators of your business. I am a big fan of Business Plan Pro, as it offers numerous example templates that are easily adjustable and/or customizable. General Info and Format – your plan should detail factual and supportive data. Goals should be incorporated using the S.M.A.R.T (Specific, Measurable, Attainable, Realistic, and Timely) approach. Purpose Statement – Establish your Purpose Statement first. Thereafter, insure each of your plan elements serve your purpose. A clear and vivid purpose is both individual and collective. It fortifies the organization with a heart and a conscience. It’s the benchmark against which all action, mission and strategy is measured. I have listed my personal and business purpose statement for my companies for example. JDS Consulting Group and DCG: To help people realize and convey their personal power, cultivate deliberate improvement, and sustain all creation, in work and in life. Market Analysis & KMI – to include both the positive and negative ongoing or potential changes in your market. Also include SWOT Analysis – Strengths, Weaknesses, Opportunities, and Threats. Other Key Market Indicators to include services offered, pricing, locations, hours of operation, etc. Talent Assessment – review of current team members, bench strength and succession planning measures, and future talent needs. SHRM (Strategic Human Resources Management) – to include recruiting, training and development, retention, succession planning, benefits and bonus programs, performance based initiatives, team member handbooks, policy and procedures, etc. Sales and Building Blocks Template – include recent historical, as well as future sales and financial information that will affect your business both positively and negatively. Customer Service (Hospitality Climate & Culture) – evaluate internal customer service with available measures such as customer surveys, complaint data, trial and repeat customer counts, Secret Shopper results, and other customer service/experience data. Marketing/Brand Building – marketing plans for local and regional store marketing, as well as a continuously expanding and improving brand awareness and brand equity. Operational review – audit results, production/process review, new business format, etc. Real Estate/Development – as related to new locations or business formats. Technology – POS system, IT, other technology related items. Continuous Improvement – including continuous education, system or process improvements, etc. Whether you are starting a new business or maintaining an existing one, Working Business Plans can prove vital to the growth and sustainability of your business and keep you from becoming a statistic of business failure!